Record label launches new series of filmed live performances from one of Liverpool's most iconic music venues. LIVERPOOL, UNITED KINGDOM, February 11, 2019 /EINPresswire.com/ — Jacaranda Records has unveiled the first of a series of live filmed performances from the legendary Liverpool venue with the launch of no-holds-barred session series The Basement Tapes on YouTube. Filmed in front of an invited audience in the cellar of the city's iconic Jacaranda Club – home of the Merseybeat – the series will feature intimate sets from the label's diverse roster of collaborators, with a sharp focus on raw musicianship and performance throughout. Produced & Directed by Ray Mia, the first of these broadcasts features two artists the record label is currently working with. Shards perform current single ‘Reflections’ and a brand new tune ‘My Birthday’, whilst the Bohos can be seen giving explosive renditions of ‘Stupid’ and ‘Give Up’. 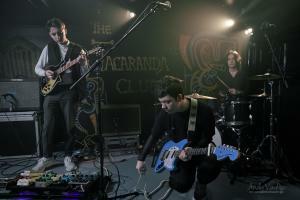 The show catches both bands as they prepare for a series of upcoming festival dates, with Shards recently completing work at Parr Street Studios on a series of new releases and The Bohos – freshly returned from their UK national support tour – providing a first public airing of two epic new tracks ahead of a landmark year for both artists. With several more sessions already slated for 2019, The Basement Tapes offers a global audience the opportunity to experience some of the UK’s most exciting new artists playing live and unvarnished in one of the epicentres of the legendary Liverpool music scene. Proudly Made in Liverpool, over the coming months future editions will feature a diverse range of artists and styles, with the emphasis on quality, energy, and pure, unfettered music from a lineup of both local Merseyside acts and invited players from across the globe. Click here to watch The Jacaranda Basement Tapes.